German Cup winners Wolfsburg upset Bundesliga champions Bayern Munich on penalties to win their first domestic Super Cup at the Volkswagen Arena. Arjen Robben's second-half strike from close range looked to have secured victory for Bayern, who were searching for their first Super Cup triumph since 2012 after successive defeats to Borussia Dortmund. But substitute Nicklas Bendtner - who scored just one goal in 18 league appearances for Die Wolfe last season - equalised in the 89th minute after a terrific cross from Belgian international Kevin De Bruyne. With no extra-time played, the match went straight to penalties with Xabi Alonso the culprit for Pep Guardiola's Bayern who lost the shootout 5-4. Alonso - Bayern's second penalty taker - was thwarted by Wolfsburg's Belgian goalkeeper Koen Casteels who saved with his legs, while Dieter Hecking's Wolfsburg were successful with all five of their spot kicks. 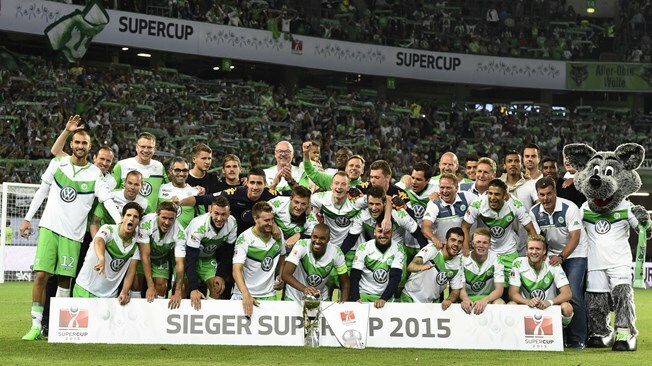 Former Arsenal striker Bendtner also converted the winning penalty to cap a fine personal performance as Wolfsburg secured the first piece of silverware of the season. Pep Guardiola's Bayern went into the match as slight favourites at the home of last season's Bundesliga runners-up Wolfsburg, who hammered the Bavarians 4-1 in their last meeting on this ground. In the match played before the start of every Bundesliga season between the previous campaign's league champions and Cup winners, both sides contributed to what was at times a high quality opening period with slick passing and fluid movement. Wolfsburg - who finished ten points adrift of Bayern last season - could've taken the lead after 32 minutes when Ivan Perisic's cross evaded the clutches of several Bayern defenders only for German international goalkeeper Manuel Neuer to punch clear. But Bayern began to stamp their authority on the game with their trademark possession football, and they took the lead just four minutes into the second half. The impressive Brazilian Douglas Costa - a €30m arrival from Shakhtar Donetsk in the summer - fired in a cross which Casteels spilled into the path of Dutch international forward Robben who blasted high into the net. But just as Bayern looked like seeing out the match, Wolfsburg struck a leveller one minute before added time. Former Chelsea man De Bruyne - who contributed 28 assists for the Wolves last season - fired in a cross towards Bendtner who turned the ball past Manuel Neuer magnificently to make it 1-1. Penalties ensued with Wolfsburg prevailing 5-4 in a high quality shootout. It's Bayern's third-straight defeat in the Super Cup, which remains the only domestic trophy that Guardiola hasn't won during his tenure at the Allianz Arena. Both sets of players wore black armbands during the game after the death of Bayern club legend Franz Beckenbauer's son, Stefan, who died on Saturday at the age of 46 after a long illness.